Web Review of Todar's Online Textbook of Bacteriology. "The Good, the Bad, and the Deadly"
Tag words: innate immunity, natural immunity, antimicrobial defense, individual resistance, cellular defense, lysozyme, complement, normal flora, inflammation, inflammatory exudate, phagocytosis, opsonization, neutrophils, macrophages, oxidative burst, mast cells. Figure 1. 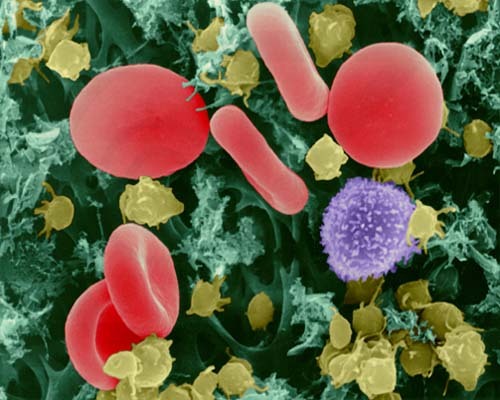 Human blood contains most cellular and noncellular factors that participate in host immunity to bacterial pathogens. Humans are in continuous associations with microorganisms, including those that readily colonize the body surfaces (see The Bacterial Flora of Humans). It is relatively rare that these microorganisms cause damage to their host. In part, this is due to the effectiveness of the host defense mechanisms, which restrict invasion by normal flora (some of which may be potential pathogens), and which defend against non-indigenous microorganisms that are overt pathogens. The outcome of an interaction between a human host and a microbe, whether it is a component of the normal flora or an exogenous pathogen, depends on specific properties inherent to both the host and the microbe. Sometimes, the host tolerates colonization by a parasite but restricts it to regions of the body where it can do no harm (e.g. Staphylococcus aureus on the nasal membranes or Streptococcus pneumoniae in the upper respiratory tract). If the parasite invades (i.e., breaches an anatomical barrier or progresses beyond the point of colonization), an infection is said to have occurred. If, as a result of infection, pathological harm to the host becomes evident, this is called an infectious disease. The healthy animal defends itself against pathogens different stages. The host defenses may be of such a degree that infection can be prevented entirely. Or, if infection does occur, the defenses may stop the process before disease is apparent. At other times, the defenses that are necessary to defeat a pathogen may not be effective until infectious disease is well into progress. The host defense mechanisms are mediated by the immune system. For our purposes, the term immunity refers to the relative state of resistance of the host to infectious disease. I will adopt the nomenclature used by my colleagues at University of South Carolina School of Medicine Microbiology and Immunology On-line to draw lines between the "types of immunity", particularly as it relates to to innate immunity and adaptive immunity. The immune system is composed of two major subdivisions, the b>innate or nonspecific immune system and the adaptive or specific immune system. The innate immune system is a primary defense mechanism against invading organisms, while the adaptive immune system acts as a second line of defense. Both aspects of the immune system have cellular and humoral components by which they carry out their protective functions. In addition, there is interplay between these two systems, i.e., cells or components of the innate immune system influence the adaptive immune system and vice versa. The innate and adaptive immune systems differ in several ways. The adaptive immune system requires some time to react to an invading organism, whereas the innate immune system includes defenses that, for the most part, are constitutively present and mobilized immediately upon infection. Additionally, the adaptive immune system is antigen specific and reacts only with the organism that induced the response. The innate system is not antigen specific and reacts similarly to a variety of organisms. Finally, the adaptive immune system exhibits an immunological memory. It "remembers" that it has encountered an invading organism and reacts more rapidly on subsequent exposure to the same organism. The innate immune system does not exhibit a memory response. Cellular defense. This term is used to distinguish whether an immune response is mediated by a particular type of cell, as opposed to a non cellular defense which does not involve a specifically programmed cell. As stated above, a variety of tissue cells are involved in innate and adaptive immunity, hence the term cellular defense. These include neutrophils and macrophages, which are involved in phagocytosis, basophils and mast cells, which are involved in inflammation, and B cells and T cells which account for antibody mediated immunity and cell mediated immunity, respectively. 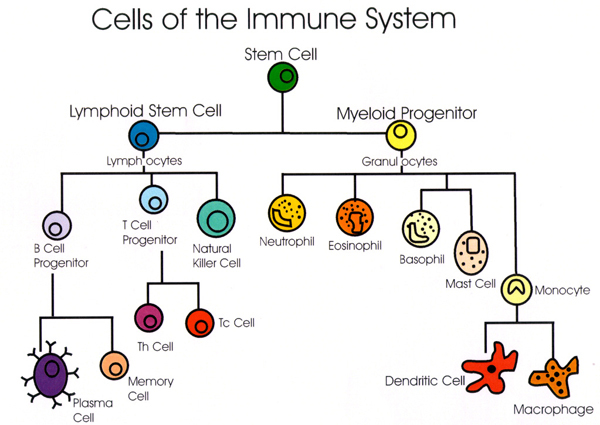 All these cells have their origin in the bone marrow (Figure 2). Myeloid progenitor (stem) cells in the bone marrow give rise to neutrophils, eosinophils, basophils, monocytes and dendritic cells, while lymphoid progenitor (stem) cells give rise to T cells and B cells. Macrophages and dendritic cells, which play a key role in innate and adaptive immunity, are derived from monocytes; and mast cells, which are fixed in tissues, develop from the same precrusor cell as circulating basophils. B cells are produced in bone marrow and released into the blood and lymphatic systems. B-cells can develop into plasma cells that secrete antibodies. Precursor T cells undergo differentiation in the thymus into two distinct types of T cells, CD4+ T helper cells, and the CD8+ cytotoxic T cells. Macrophages and dendritic cells function as one of several bridges between innate immunity and adaptive immunity, since they present antigens to immunocompetent T-cells, which initiates an immunological response. Figure 2. Development of cells that participate in immunity.